Pastor Jay is ordained in the Evangelical Free Church of America. He and Becky have been in full time ministry since 1987. 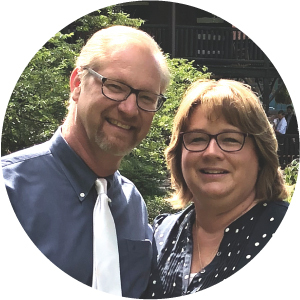 They previously pastored two different churches—one in Balaton, Minnesota (3 years) and one in Midland, Michigan (for 23 years). They have been at EFCCL since October 2013. Jay earned a B.A. from Cornerstone University, and an M.Div. and Doctor of Ministry from Trinity Evangelical Divinity School. He has published articles in Leadership Journal, Preaching, Evangelical Missions Quarterly, The Evangelical Beacon, Engage, and The Leading Edge. Becky enjoys speaking at women's events and conferences, and has an active ministry discipling women. Pastor Jay grew up in southern California and then moved to Michigan as a teenager. Becky grew up in Boulder, CO, where she and Jay were eventually married. Jay also served on staff, at the Free Church in Boulder, as an intern for 7 months. They have three children: Ben (married to Ellie), Stacy (married to Andrew), and Heidi (married to Shawn). Jay and Becky also have four grandchildren. In their free time, Pastor Jay and Becky love to hang out with friends, eat junk food, and watch epic movies like the Lord of the Rings trilogy, and Gettysburg. Jay and Becky also enjoy traveling, leading study tours to Israel and visiting missionaries around the world. Some of their favorite countries they've visited include: Malaysia, India, Greece, Ireland, Bosnia, Egypt, and Saudi Arabia. Jay writes, "I love the Old Testament (Hebrew Bible). It contains such diverse material and stories of God working among His people. I thoroughly enjoy reading the historical books and then meditating in the wisdom books. The theology of the Old Testament is rich and nourishing. The prophets are also fascinating to read, as they summoned God's people back to surrender to their holy God. I also love to read books on just about any topic." Some of Pastor Jay's favorite authors include: Tim Keller, D.A. Carson, Louis L'Amour, Rodney Stark, Al Mohler, John Piper, R.C. Sproul, and Martyn Lloyd Jones. Becky is also an avid reader. Some of her favorite authors include: Elizabeth Elliott, Carolyn Curtis James, John MacArthur, John Piper, Jerry Bridges, Joni Eareckson Tada, and A.W. Tozer. This year will be Doug Friesen's 23rd anniversary at EFCCL (he joined the staff in 1995), and he has been in full-time ministry for 27 years. Doug oversees both Worship and Children’s Disciple-making ministries. He previously served as Worship Pastor at Evangelical Free Church of Moline, Illinois, where he met his wife, Lisa. Doug holds a Bachelor of Church Music from Wayland Baptist University (1989) and two Masters of Music degrees from the University of Missouri in Columbia, MO (Choral Conducting and Piano Pedagogy/Accompanying, 1991). Doug is ordained by the EFCA with a Certificate of Ministry License (2000). During his free time, Doug loves playing with his dog, teaching piano lessons, cooking, and reading. "I love the book of Isaiah and find great comfort and encouragement in the truths found in this book. Recently, Isaiah 43:1-2 holds great meaning for me (emphasis added): 'Do not fear, for I have redeemed you; I have summoned you by name; you are mine. When you pass through the waters, I will be with you; and when you pass through the rivers, they will not sweep over you.'" Pastor Ron has been called to be a disciple-maker of students. He has served with NEXUS Student Ministries for the last 20 years at EFCCL (Ron joined our staff in 1998). Ron has a B.A. in educational ministries with a focus on youth ministry from Moody Bible Institute, a Masters in religious studies with a focus in disciple-making from Trinity Divinity School in Deerfield, and a Certificate of Christian Ministry from the EFCA. Pastor Ron is among the fourth generation of his family to be involved at EFCCL. He has grown as a disciple and disciplemaker in this church. He and his wife, Mystele, have two boys—Isaiah and Logan. If he and Mystele were in American Idol, she would win and he would lose! The Kirkeengs enjoy sports, pizza, and movies as a family. In his free time, Ron enjoys the outdoors and keeping active. He is involved in Crystal Lake baseball and coaching. His sons enjoy baseball, football, and Nerf wars. The Kirkeengs also enjoy fine food like donuts, chocolate, coffee, steak, brisket, and pizza! to live out Proverbs 3:5-6 every day, 'Trust in the Lord with all your heart and lean not on your own understanding; in all your ways submit to him, and he will make your paths straight.'" Pastor Tim has had the privilege of serving full-time in ministry since 1986. His first position was Pastor of Youth & Education at a church in Chicago; he then served as a senior pastor in two churches in Ohio and Illinois. Tim joined our staff in December 2008 as the Pastor of Children's Ministries. He moved into his current role in the Fall of 2017. He has a B.A. from Moody Bible Institute and an M.A. in religion from Trinity Evangelical Divinity School. Tim was ordained by his home church in 1991 and is licensed with the EFCA. Pastor Tim and his wife, Margie, both grew up in Chicago. They first met while in high school, dated a few years later, and were married in June of 1986. Their oldest daughter, Betsy, and son-in-law, Meda, were married in November 2011. Their second daughter, Merry, graduated in 2013 with a degree in criminal justice. Their son, Tim, graduated from Trinity in December 2015. As a family, they enjoy playing games and watching movies together. Tim and Margie have two grandchildren, Ramon and Mia. Pastor Tim loves to read (especially U.S. history, biographies, and biblical & theological topics). He and his wife enjoy taking walks and going to places like Brookfield Zoo, downtown Chicago, and the Art Institute. "If I had to pick one verse, it would be Ephesians 2:8-10. It is a great description and promise of God's amazing grace for salvation and spiritual growth. Books of the Bible that I turn to often are Psalms and Proverbs - appreciating the theme of wisdom and identifying with the honest emotions of the writers."